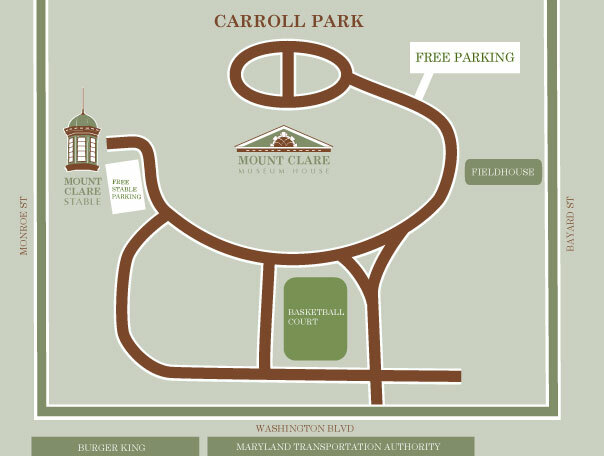 Mount Clare Museum House is located in historic Carroll Park in Southwest Baltimore commonly referred to as Pigtown. It sits on top of the highest point in the park. The entrance into the park is off of Washington Boulevard. Once you enter the park, follow the driveway up to the house and park in front of the mansion or in the nearby lot. Parking is free. 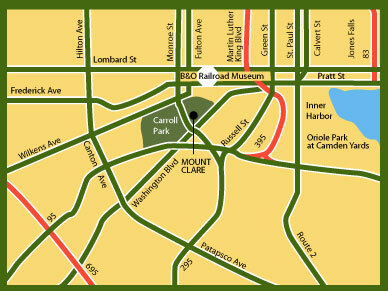 Mount Clare Museum House is located in Southwest Baltimore in historic Carroll Park, in area commonly referred to as Pigtown. It sits on top of the highest point in the park. The access road into the park is at 1500 Washington Boulevard. Once you enter the park, follow the driveway up to the house and park. Please refer to the detail map of Carroll Park below. Go west on Lombard Street. Turn LEFT onto Martin Luther King Jr. Boulevard. Go two blocks, turn RIGHT onto Washington Boulevard. Carroll Park is 0.8 miles on the right. Exit Maryland Avenue. Continue south on Maryland Ave. RIGHT on Chase Street following signs to I-95. Chase becomes Martin Luther King Jr. Boulevard. RIGHT onto Washington Boulevard. Carroll Park is 0.8 miles on the right. Take exit 51, marked Washington Boulevard. Turn LEFT at the bottom of the exit ramp onto Washington Boulevard. Go approximately 1/4 mile, continuing through the light at Monroe Street. Proceed 1/2 block then turn LEFT into Carroll Park. Go through the Fort McHenry Tunnel. RIGHT on Exit 53. Follow I-395 to Martin Luther King Jr. Boulevard. Turn LEFT onto Washington Boulevard. Carroll Park is 0.8 miles on the right. Take Monroe Street exit to Washington Boulevard. Turn Right onto Washington Boulevard. LEFT into Carroll Park. There is a bus stop at the entrance to Carroll Park served by the Number 11 bus. The walk from the bus stop to the museum is about 5 minutes, uphill. Numerous taxi services can bring you to Mount Clare. Ask the driver to return in 1 ½ hours. The address you should give to the driver is 1500 Washington Blvd in Carroll Park. The Museum is located in the center of the park. Mount Clare and Carroll Park are part of the Gwynn’s Falls trail system. We do not have a bike rack in the historic area, but bikes may be locked to our sign post or fence. For the adventurous, Mount Clare can be reached on foot from the Inner Harbor. Depending on your starting point and route, the walk is about 2 miles. After entering the park, continue straight on the park road, past the basketball courts on the left. At the next intersection, bear right. Follow the road as it winds up and around the hill. Mount Clare will be on your left. Parking for cars and buses is available on the park road near the house. There is also a large parking lot near Mount Clare. Buses may discharge passengers directly in front of Mount Clare’s gates before parking. After entering the park, continue straight on the park road. After passing the basketball courts, make the next left. Follow this road west, toward Monroe Street. As you approach the Monroe Street side of the park, make the first right. This smaller road will lead to the brick Mount Clare Stable. Buses can park directly in front of the Stable. Cars may park on the grass nearby.